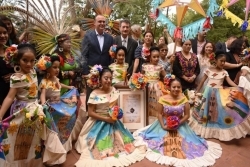 Manhattan, NY, March 19, 2019 --(PR.com)-- This is a banner year for San Miguel de Allende, Mexico, as it celebrates its 12-month reign as American Cultural Capital for 2019. The designation is an honor bestowed annually to one city from across North, Central and South America that demonstrates remarkable heritage, culture, and tradition. San Miguel de Allende’s status as this year’s titleholder was announced in January by the Executive Council of the International Bureau of Cultural Capitals in Barcelona, Spain. The title is held from January 1 through December 31. More than 2,000 people joined Municipal President Luis Alberto Villarreal Garcia and president of the International Bureau of Cultural Capitals, Xavier Tudela, at opening ceremonies in San Miguel de Allende. The event began with a two-hour performance by tenor Fernando de la Mora, accompanied by Latin Grammy winning singer Eugenia León. The program also included a video celebrating the traditions, culture, craftsmanship and character of San Miguel de Allende and its people. The entire event culminated with a brilliant firework display that lit up the sky. Accompanied by the “Guardians of Culture,” Municipal President Villarreal shared that “San Miguel de Allende is an example of a multicultural society that faces the influence of the exterior. “Being the American Capital of Culture translates to comprehensive projects for culture, art and traditions, as well as an agenda of important activities that allow us to reach all corners of the city and rural communities,” he added. 1. The Parish of San Miguel Arcangel and its historical temples. 2. The Shrine and House of Spiritual Exercises of Jesus Nazareno de Atotonilco. 3. The Feast of San Miguel Arcangel. 4. The Festival of the Lord of the Conquest. 6. The Canada de la Virgen Archaeological Zone. The designation of American Cultural Capital also extends to the 45 other municipalities in the state of Guanajuato, all of which will be able to participate as subsites of San Miguel de Allende. Special events and activities will be taking place to celebrate the title across the region in 2019. San Miguel de Allende was registered by UNESCO as World Heritage Center in 2008, honored for its cultural and architectural contribution to the Mexican Baroque style, as well as its historic position in the struggle for the independence of Mexico from Spain. In 2018, San Miguel de Allende was named for the second year in a row by Travel + Leisure magazine as the Best City in the World, thanks to its quality of service, friendliness, cuisine, cleanliness and shopping, as well as for its cultural contribution, architectural beauty and places of entertainment. The American Capital of Culture (www.cac-acc.org) was created in 1998 with the mission to educate the people of the American continent on their common cultural heritage, as well as on the national and regional diversities. The title was designed to establish bridges of cooperation with other cultural capitals of the world. San Miguel de Allende, better known as the “Heart of Mexico,” is considered the forge of national independence, the birthplace of illustrious Mexicans and a colonial jewel distinguished by the warmth and generosity of its people and its rich history, both cultural and architectural. On July 7, 2008, it was named by UNESCO a Cultural Heritage city under the title of “Protective town of San Miguel and the Sanctuary of Jesús Nazareno de Atotonilco.” The distinction was awarded due to its cultural and architectural contribution to Mexican Baroque. In 2013, it was recognized as the best city in the world by Condé Nast Traveler International magazine. See www.visitsanmiguel.travel.